On the Loose in New York City, On the Loose in Philadelphia and On the Loose in Boston. With simple rhymes and colorful, highly detailed images, cartoonist Sage Stossel creates a "Where's Waldo? "-style hit, setting animals free from the National Zoo and challenging children to find them in settings from the National Mall to Georgetown, Dupont Circle, and the Air and Space Museum. Children will have a ball helping the keeper find a monkey at the Library of Congress, a kangaroo at the Supreme Court, or a Hippo in the Tidal Basin! 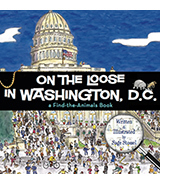 Over 100 animals are hiding cleverly in favorite DC locations in this colorfully-illustrated rhyming picture book. "Beautifully illustrated, intelligently conceived, brilliantly witty and entertaining... If you are visiting, or if you live here, or if you just want to take memories with you, On The Loose in Washington, DC is the book to own." "Antelopes in Dupont Circle and kangaroos at the Supreme Court? In this funny and whimsical picture book, which offers readers both an engaging story and a hidden-object game, Sage Stossel turns the city of Washington into a giant playground, with benevolent beasts hiding just out of eyesight in every neighborhood. Like all the best children's books, On the Loose in Washington, DC takes the familiar and transforms it into something wondrous." "This imaginative book is as much fun for parents as it is for children. 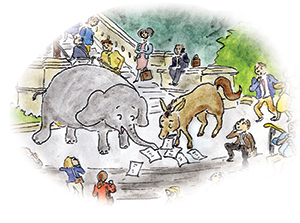 Sage Stossel is a longtime political cartoonist, and older readers will enjoy her clever sense of satire: a donkey and elephant tussle outside the Capitol, while a kangaroo approaches the Supreme Court. Younger readers will love finding the animals. And people of all ages will delight in seeing the nation's capital as it should be—a cheerful city with beautiful buildings, blue skies, and all kinds of happy creatures." Exciting News!--The first book in the series, On the Loose in Boston, has been selected by Boston Mayor Marty Walsh for his Youth Reading List.